As the rest of the world works itself into a panic over debt and deficits, Princeton professor and New York Times columnist Paul Krugman continues to argue that acting on this fear will quickly make things far worse:What’s the greatest threat to our still-fragile economic recovery? Dangers abound, of course. But what I currently find most ominous is the spread of a destructive idea: the view that now, less than a year into a weak recovery from the worst slump since World War II, is the time for policy makers to stop helping the jobless and start inflicting pain…Both textbook economics and experience say that slashing spending when you’re still suffering from high unemployment is a really bad idea — not only does it deepen the slump, but it does little to improve the budget outlook, because much of what governments save by spending less they lose as a weaker economy depresses tax receipts. And the O.E.C.D. predicts that high unemployment will persist for years. 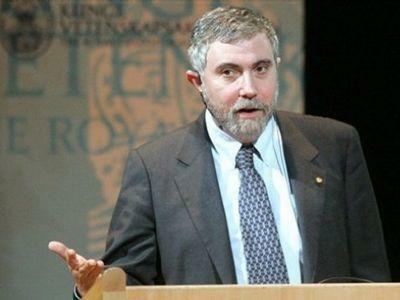 Nonetheless, the organization demands both that governments cancel any further plans for economic stimulus and that they begin “fiscal consolidation” next year.In terms of short-term impact, Krugman’s logic makes sense. Anyone who argues that we should cut spending instantly without acknowledging that this will cause major short-term pain is either delusional or disingenuous.But the longer term implications of continuing to spend boatloads of money we don’t have also needs addressing. Specifically, Prof. Krugman needs to explain why debt-fear-mongers like Niall Ferguson are wrong that, once government debt hits about 90% of GDP (where ours is headed), default is pretty much inevitable.Pointing to the post-World War II experience, when US government debt soared and then shrank gradually as a percent of GDP over the next two decades, doesn’t take into account the massive consumer and financial debt the country currently carries. In those days, it was just the government that borrowed up to its eyeballs. Today, in terms of total debt to GDP, we’re in completely uncharted territory.